Our declining balance food program is designed to provide residents with a nutritious, value-packed meal program allowing for maximum value and flexibility. The meal plan saves time and money. Time isn’t spent shopping for food, cooking, and cleaning up the mess. This gives res students extra time to study, visit friends or participate in campus activities. Our meal plan saves money since food purchased on the residence meal plan is non-taxable. To fit everyone’s appetite, while living in residence, Brandon University is pleased to offer Meal Plan options for the mandatory meal program. While eating in Harvest Hall simply present your student ID card at the cash register. The card is read by the card readers and the purchase is deducted from your food account. Please Note: The loss of an identification card must be reported to the Residence Office, where a new one can be purchased for a charge of $31.25. Do not punch holes in your ID card, as it may disable the radio frequency reader embedded in the ID card. Our kitchen can meet specific dietary needs such as low sodium diets and vegetarian diets, however residents on such diets will have a more limited menu choice. Residents on such diets are still responsible to contribute the full amount to the food program. Meal plan money can be carried over from first to second term, but must be used by the end of second term. Refunds for unused money are available in the Premium Plan, refunded to the level of the Value Plan. Bulk Orders on meal plan accounts are not available. Only items stocked on Harvest Hall shelves or available through the Harvest Hall food stations are allowable meal plan purchases. Harvest Hall closes for the Christmas break on or around December 19th. In the second term, Harvest Hall closes on or around April 24th, with providing meals in our Down Under location (Basement). You don’t need to carry cash! Meal cards are available even if you live off-campus. 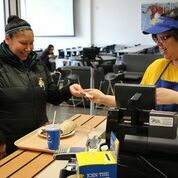 Faculty and students can take advantage of the convenience the meal card offers in Harvest Hall. Any amount of money can be put on your Student ID or Commuter card at the Residence Office in McMaster Hall or at Financial and Registration Services Office in Clark Hall. So, whether you are getting the lunch special or just grabbing a coffee and muffin, the Off-Campus Meal Card is a practical and economical way to eat. Please Note: Off-campus meal purchases are taxable. GST/PST is collected at time of purchase.